The 2004 Harley Davidson Custom Deuce for Sale has Screamin Eagle chrome mag wheels, Vance and Hines exhaust pipes, 2 piece rotors, saddle and comes with warranty. This Deuce is a beauty from the gorgeous deep red, metallic paint job to its chromed, raked front fork and chrome riser. It has a stretched gas tank topped by a full-length chrome console. The motorcycle has a black and chrome, fuel injected, Twin Cam 88 INCH B engine, five speeds, 2 piece rotors, Vance & Hines exhaust pipes and a security system. This bike is an eye catcher and handles perfectly with an 88 cubic inch motor with a 5 speed manual transmission. If you're interested in buying or have questions regarding the Deuce, you can contact me using the number below and don't forget to mention that you found my ad on GoGoCycles Used Motorcycles for Sale (and PLEASE do not neglect to include your contact information in your email or to provide a phone number or email address!) so that I can respond with answers to your questions or after consideration of your best offer as quickly as possible. In my opinion, you won't find a nicer custom softail deuce for sale in Temecula, CA near San Diego CA California, on Craigslist or in an Ebay auction so hurry and make an offer before it gets away from you! 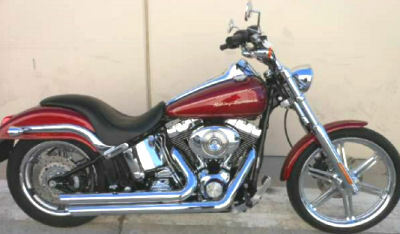 Strike Lightning would also encourage bikers to submit a review of the 2004 Harley Davidson Custom Deuce for Sale to make the biker community aware of any problems that are commonly associated with the softail deuce or to highlight its positive features and help potential buyers make informed decisions. The 2004 Harley-Davidson Deuce Custom is priced to make a fast sale at only $10399 so call me today (NO EMAILS) at (951) 251-1145.